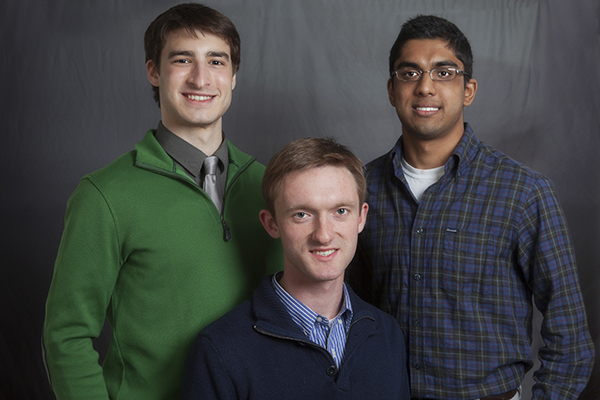 2014 Goldwater Scholars (from left) Benjamin Lefler, Daniel Charytonowicz and Adam Ramsaran. 9:11 a.m., April 9, 2014--Three University of Delaware students have earned scholarships from the Barry M. Goldwater Scholarship and Excellence in Education Foundation, considered the premier undergraduate award of its kind. The three UD students  Daniel Charytonowicz, a biomedical engineering and computer science major; Benjamin Lefler, a chemistry major; and Adam Ramsaran, who is majoring in neuroscience  were among 283 Goldwater Scholars selected on the basis of academic merit from a field of more than 1,100 mathematics, science, and engineering students across the U.S. The scholarship program honoring the late senator was designed to foster and encourage outstanding students to pursue careers in the fields of mathematics, the natural sciences, and engineering. Charytonowicz, an Honors Program student who is from Wantagh, N.Y., plans to earn both an M.D. and a Ph.D. in biomedical engineering so that he can conduct research to expand the clinical capabilities of medical diagnostics technology. Charytonowicz, whose research is advised by James Hoffman, professor in the Department of Psychology, is conducting a study to understand the cognitive mechanisms of visual attention  in other words, how our brain collects, sorts, and processes visual information. The work involves presenting a series of images in rapid succession to human participants while they are connected to an electroencephalograph (EEG) machine, which provides information about how various stimuli are processed by the brain. Inspired by his parents, a biologist and an IT specialist, Charytonowicz began his research career very early  the summer before he entered high school, when he worked at Columbia University Cancer Center. Within the next two years, he wrote his first software application and co-authored two scientific publications. Lefler, an Honors Program student who came to UD from Haddonfield, N.J., plans to continue his education with a doctoral degree in inorganic chemistry. His goals are to conduct research in solar energy conversion and teach at the university level. Advised by Joel Rosenthal, assistant professor in the Department of Chemistry and Biochemistry, Lefler is currently doing research on the synthesis and characterization of porphyrinoid derivatives, molecules that are similar to chlorophyll, the light harvester in plants. Lefler’s fascination with chemistry was inspired by John Sohn, his AP chemistry teacher at Haddonfield Memorial High School. A resident of Newark, Del., Ramsaran plans to earn a Ph.D. in neuroscience and then teach at the university level, with research focusing on the neural mechanisms by which neurodevelopmental disorders affect cognition. Under the advisement of Mark Stanton, professor in the UD Department of Psychology, Ramsaran is conducting research aimed at defining the neurobehavioral characteristics of context-dependent object and spatial learning and memory during embryonic development. “This research is particularly useful for understanding when and how different types of learning develop in relation to the functional development of their neural correlates,” he says. For his senior thesis, Ramsaran plans to apply the behavioral paradigms he’s been working on to a rodent model of fetal alcohol spectrum disorders to determine whether these forms of learning and memory are vulnerable to early alcohol exposure. If so, he will extend the work to investigate behavioral and pharmacological interventions that may reverse the resulting cognitive deficits. The Goldwater Scholars Program was established by Congress in 1986 to honor U.S. Sen. Barry Goldwater, who served his country for 56 years as a soldier and statesman, including 30 years of service in the U.S. Senate. The purpose of the foundation is to provide a continuing source of highly qualified scientists, mathematicians, and engineers by awarding scholarships to college students who intend to pursue research careers in these fields. The one- and two-year scholarships cover the cost of tuition, fees, books, and room and board up to $7,500 per year. According to the foundation, Goldwater Scholars have very impressive academic qualifications that have garnered the attention of prestigious post-graduate fellowship programs. Recent Goldwater Scholars have been awarded 80 Rhodes Scholarships, 117 Marshall Awards, 112 Churchill Scholarships, and numerous other distinguished fellowships such as the National Science Foundation Graduate Fellowships.